This submerged pinnacle just off Langkoi Island to the Southwest of Komodo can be an exhilarating dive. It is extremely exposed and experiences strong currents and surge. The topography drops off dramatically into deep water. Highlights here are sharks. Grey reefs, Whitetip reef sharks, hammerheads and bronze whalers aggregate around this site from July to September. 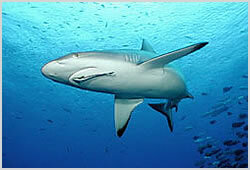 It is reputed to be a breeding ground for grey reef sharks in April. This dive is for experienced divers only.